Winner! 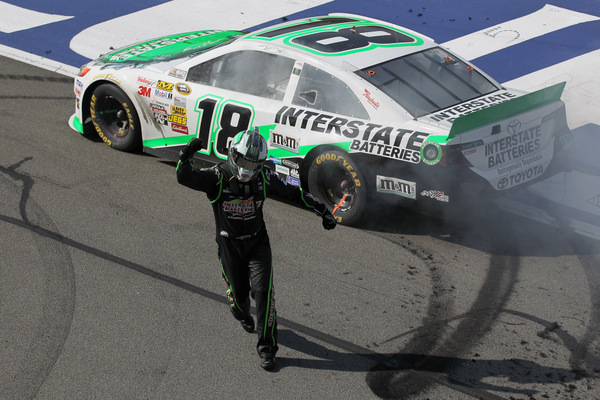 Kyle Busch, who Sunday survived the best, wildest and most frightening finish at California's Auto Club Speedway since it opened in 1997. But Denny Hamlin was taken to a Ontario hospital after a savage nose-first crash into an unprotected concrete wall during a fender-banging battle for the lead with Joey Logano on the last lap of the California 400. And Logano, who finished last week's Bristol 500 with a run-in with Hamlin, found himself in yet another post-race brouhaha, this time with an angry Tony Stewart, with punches thrown on pit road. Busch was the day's big lap leader, dominating most of the three-hour race. 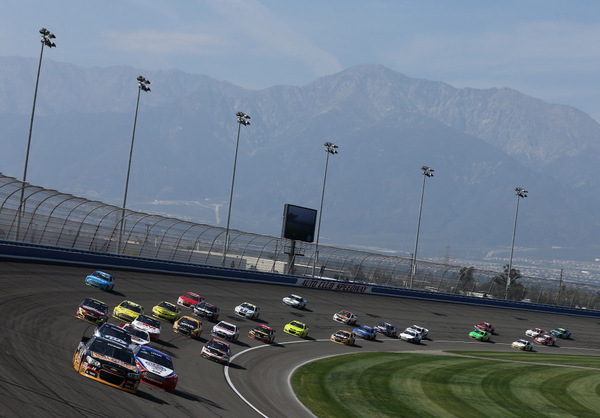 But Logano was the man on the inside of the front row for the final restart, with less than 50 miles to go in the 400-miler at the two-mile track just east of Los Angeles. Stewart, just behind Logano for that restart, dived to the apron into the first turn in a bid for the lead. But Logano blocked him, and then chopped him off. Stewart saved his anger for the post-race pit road run-in. Logano held the lead down the stretch, when Busch faded a bit. But Hamlin, who had put Logano in the wall at Bristol seven days earlier in a battle for the lead, was right on Logano's tail. Hamlin made a bid to the outside of Logano in the final miles, and the two bounced off each other several times. The climax came on the last lap, when the two again hit hard, Logano heading into the outside wall, while Hamlin headed into the inside wall. Hamlin managed to climb from his car but immediately lay down on the track, in pain. 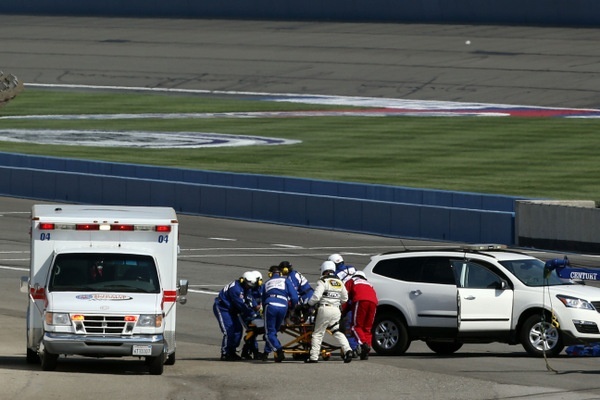 He was taken first to the infield care center, then transported to a local hospital. Meanwhile out on pit road, Stewart got out of his car and charged toward Logano. The two threw punches but it was unclear if any landed before the crews broke up the encounter. Logano tried to downplay the entire situation. But Stewart ripped into Logano verbally, calling him a "rich kid who never had to work a day in his life." And Stewart said he intended to teach Logano a lesson. That would seem a perfect lead-in to the NASCAR tour's next stop, at Martinsville, Va., April 7th. Stewart was hot afterwards, and didn't mince words. "Joey spun the tires on the restart," Stewart said. "Everybody had trouble with that; but it's not my fault he spun the tires. "For a guy that has been complaining about how everybody else is driving here, and then to do that, it's a double standard. "He makes the decision to run us down there (toward the infield)... and when you run a driver down there, then you take responsibility for what happens after that. "He is a tough guy on pit road as soon as one of his crew guys gets in the middle of it. Until then he's a scared little kid. Then he wants to sit there and throw a water bottle at me. "He is going to learn a lesson. "He can run his mouth on Twitter all he wants tonight. I've got plenty of people that are going to watch for that. "It's time he learns a lesson. He's run his mouth long enough. "He has this double standard... and he's nothing but a little rich kid that has never had to work in his life. He's going to learn from us working guys that had to work our way up how it works." However Logano's block on Stewart was almost exactly the same move Stewart himself pulled on Michael Waltrip last year at Talladega, triggering that huge last lap crash. Still Stewart was on a rant: "It's no excuse for Joey to do what he did. "I'm just tired of watching these kids whine... and then they sit there and act tough when their crew guys get in the middle of it. "If NASCAR wants us to let the 'guys have at it,' it shouldn't be any different than hockey -- Let the guys have at it, and when one guy goes to the ground, then it's over." Logano at Bristol had vowed to take his measure of Hamlin, for their run-in. This time it was Stewart vowing to take his measure of Logano: "If he ever turns down across in front of me again, I don't care what lap it is, he won't make it through the other end of it. "If I didn't hit the (engine limiting) chip, he wouldn't have made it through turn one to begin with. "I'm tired of these guys doing that stuff... especially out of a kid that's been griping about everybody else. "I mean he's sent Denny to the hospital and screwed our day up. "He's talked the talk, but he hasn't walked the walk yet. He's always got his crew guys walking the walk for him." And Stewart said he wasn't answering the phone if Logano were to call: "Hell no. "If he wants to talk about it, we'll talk about it....(but) after he threw the water bottle at me like a little girl, we'll go at it now." What happened, with Stewart and with Hamlin? "Racing for the lead....going for the win....that is what you've got to do. "Tony was just upset about a restart -- that I was racing him really hard on the bottom, trying to make sure I protected my spot. "I had to throw the block. That was a race for the lead. "I'll talk to him, and we'll see what happens. I think he finished decent. We'll just talk about it some more. "What I was doing actually was racing Kyle on the restart, and he was spinning his tires. The rule is you can't beat him to the start-finish line, so I am pedaling it, which gave Tony the run to go under me. I wanted to block that, because I knew if he put me three-wide, that would be the end of my race and I wouldn't win. "Then I had to do what I had to do to get to the front and try to win the race." The hard racing with Hamlin? Logano wasn't apologetic: "He probably shouldn't have done what he did last week... so that's what he gets. Submitted by lv mike on Sun 03/24/2013 - 17:40. 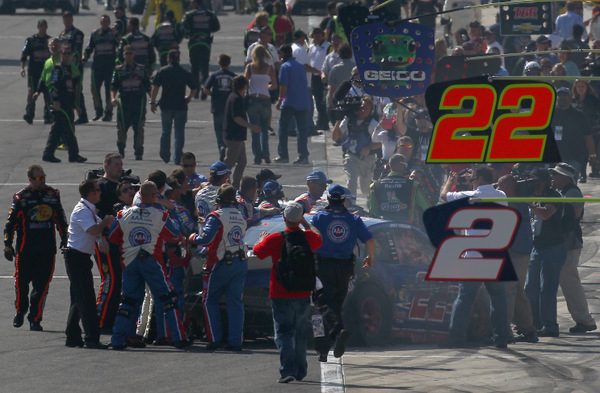 Now that was a show --- and I suspect Mr. Logano is going to have an absolutely miserable time at MVille. But when will someone take some aerial photos and get all these exposed walls covered. Why wait for the guys to find them the hard way? I kind of feel bad for lagano. Submitted by John on Sun 03/24/2013 - 22:58. I think Tony expected Joey to not drive aggressively for the win. Same with Denny. When two cars get aggressive about the same spot on the track at the same time, bad things happen. I think Joey will Learn an benefit from today's actions. Side note: I'm assuming Denny is ok and not seriously hurt. However, if Denny is hurt all bets are off for Joey as the garage will hold that against him. Submitted by Fireball Roberts on Mon 03/25/2013 - 06:10. Stewart should have sent Logano to the infield when he had the chance yesterday after Logano blocked him. Handle it when you should have, or don't cry about it later. The after-race fiasco was a bunch of nonsense. Tony blocked Michael Waltrip last year at Talladega and also cost Regan Smith a win at Talladega a few years ago by doing the exact same thing. Stewart has always been this way. It's okay when he does it, but not when somebody does it to him. Whatever it is. If he does anything to Logano, Logano needs to watch the clip of Sears Point and how Vickers handled things when Stewart got out of hand. Did Tony get called into the hauler after the race for his antics and foul language? Or did NASCAR overlook it and give him special treatment? As for Hamlin, Logano wallowed him pretty good coming to the flag, but Denny essentially wrecked himself when he hooked Logano trying to retaliate for the wallow. I've got a suspicion that Denny doesn't think the deal is now square though, so this one will continue on. If he thinks Logano is going to back down though, he's mistaken. If he wants to stay in the hunt for the title, he needs to leave it be. Submitted by archie on Mon 03/25/2013 - 14:52. Maybe it's time for the 12 cars that Stewart dumped due to his dumb move at Talledega last fall to not let HIM get through turn one. Submitted by pw on Mon 03/25/2013 - 16:12. I thought what joey did to tony was fine.Joey diden't make him finish 22.Tony wrecked a guy fri night in a midget by blocking but when it happened to him Sunday it was wrong. Joey never wrecked denny but he did rub the hell out of him and slowed his forward run.Denny turned down into joey and turned him straight into the wall and at the same time it shot his car toward the inside wall.Denny tried to spin the car around and never touched the brakes until about 20 ft from the inside wall.If denny had locked the brakes down he woulden't have been in the wall to begin with. In the end denny wrecked joey on purpose at bristol and wrecked himself Sunday.The only person denny should be mad at is himself! Submitted by RFan on Mon 03/25/2013 - 23:54. Aside from the crashing and fighting at the end of the race, there was the actual racing that was almost relegated to a side show. I am disappointed that I will never know who would have won. It seemed like Hamlin had a little more momentum than Legano, and that is maybe why Legano drove it so hard that he couldn't keep his car from climbing up the banking into Hamlin. I am sure others see it in a way that indicated that Legano would have won. Also, Kyle came by both of them like they had thrown out an anchor. This was before they had their major beating and banging that really slowed them down. Would he have passed them anyway? I also enjoyed watching the real racing in the final laps of Kenseth's win over Kahne, even thought that seemed to be more affected by aerodynamics than the race at California. If bumpy tracks are what make for good racing, then NASCAR needs to somehow make repaving simulate that immediately. We can't wait out 10 years of boring racing at a track before it gets interesting again. Some of the best racing at Rockingham and Darlington (my favorite tracks) occurred when the sand storms had deposited enough sand on the tracks that the surface acted like sandpaper to wear out the tires of those who didn't manage them. Submitted by Lance Powell on Tue 03/26/2013 - 14:00. It was a great race. Incredible crowd for NASCAR/ISC to brag about...although they're not releasing attendance data anymore. Near perfect weather. I sat in the grandstands near pit entrance. The race seemed ho-hum for a moment. Seemed like every caution that came out from our vantage point was a phantom caution, on the backstretch. Away from "minimal" prying eyes and TV as they cover the pits. It's unfortunate that there wasn't any SAFER barrier located where Denny hit. That was a hard lick. I'm sure when SMOKE sees the video replay, Logano didn't do anything wrong. Like you said Mike, Stewart at Talladega last year on Michael Waltrip or against Regan Smith at Talledega a few years back to win the race. I'm sure Gillian Zucker was more than pleased about the attendance but now questions will arise about the non-SAFER barrier in Turn 4 and elsewhere and possible re-pavement of the track. IMHO, I think the lone Fontana race would probably do better as a Saturday night race vs Sunday. Submitted by Lance Powell on Fri 03/29/2013 - 17:52. There should be NO EXCUSE for anyone who loves NASCAR racing and live in SoCal to NOT ATTEND a race @Auto Club Speedway. The seats are relatively cheap, starting at $35. Free parking if you purchase the tickets online/phone in advance (I purchased my tickets 3 weeks before the race!) The weather was perfect. The stands was packed. The racin\' was great! Even if they had pull a \"Daytona\" and race around the high groove \"freight-train\" style, watching that would have been better than watching it on TV because you can\'t duplicate the sound and fury of 185 mph coming at ya! This year, I sat Sect. 32, Row 10, Seat 18 ($35) right across from pit entrance, exiting out of the Turn 4. ACS Pres. Gillian Zucker and team has gone out of their way to bring you up close and personal with the cars and drivers with their pre-race FANZone and with an amusement park atmosphere of concerts, wrestling matches, food festivals, etc. For anyone that lives near 100 miles of ANY NASCAR track. Plan ahead, go and take someone, especially a newbie. Seeing a race live will ingrain in their brain that watching a race live is a helluva lot better than watching on TV.